Although the retail industry is transforming as technology continues to shape the consumer landscape, the primary goals of a sound retail strategy have not changed: Deliver value in the supply chain and create a unique customer experience. The rebirth of retail stores — after years of digital disruption and economic challenges — is possible if retailers can successfully contend for their consumers’ attention, and in return, earn their business. One way to do this is to design a digital and physical retail environment that captures the overtaxed attention of consumers today. In this article, you’ll learn about how retail customers predictably behave, why this behavior matters, and how you can influence it with a thought out store layout design. Use the navigation guide on the left to find a collection of essential retail floor plans and discover the pros and cons of each. If you’re ready to plan and design your store, jump ahead to the tips and best practices from professional retail designers, and browse through the design resources to help you imagine and create a new environment that captures your customer’s attention. What Is a Retail Store Layout? What Is a Free Flow Store Layout? What Is a Boutique Store Layout? A retail store layout (whether physical or digital) is the strategic use of space to influence the customer experience. How customers interact with your merchandise affects their purchase behavior. This retail principle is one of the many from Paco Underhill, author of Why We Buy: The Science of Shopping, keynote speaker, and founder of Envirosell. Store Design: The use of strategic floor plans and space management, including furniture, displays, fixtures, lighting, and signage. Website designers and user experience (UX) researchers use space management techniques and web design principles to optimize e-commerce websites. We’ll further discuss a variety of popular retail floor plans later in this article. 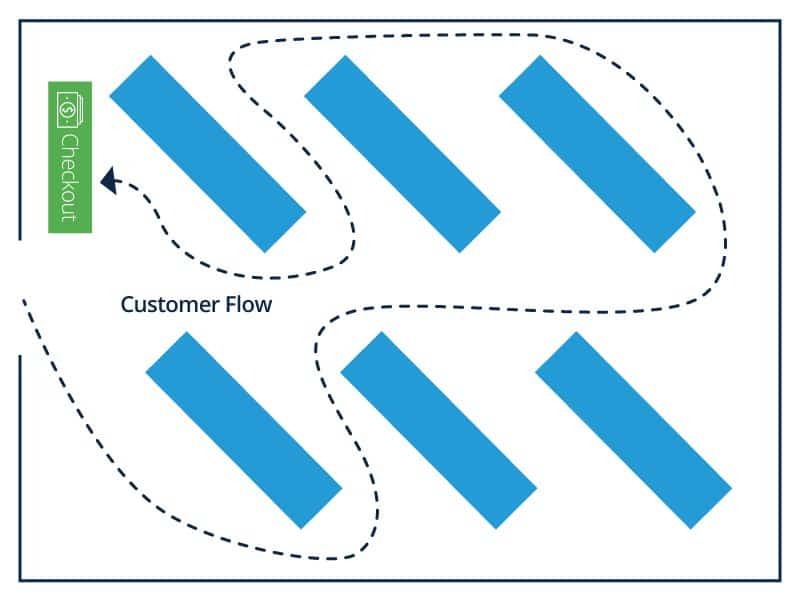 Customer Flow: This is the pattern of behavior and way that a customer navigates through a store. 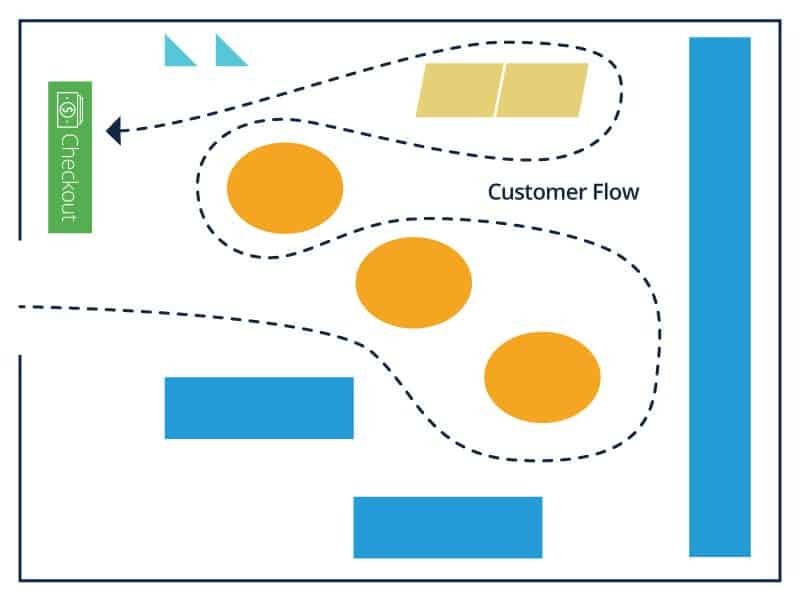 Understanding customer flow and the common patterns that emerge when customers interact with merchandise based on the store layout is critical to retail management strategy. Physical retailers are able to track this using analytics software and data from in-store video and the wifi signal from smartphones. For example, solution providers like RetailNext provide shopper analytics software for retailers to understand flow and optimize the customer experience based on in-store video recordings. The technology also exists to track the digital customer flow and online shopping behavior. Using “cookies” and other software, online retailers can track customer behavior, including how customers interact with their website. It is essential to understand your customer flow and the general patterns of navigation in your specific retail environment before you can optimize customer experience and plan a strategic store layout. Retailers, consultants, store planners, interior designers, and architects all use a variety of retail floor plans and concepts to influence customer flow and behavior. Retail giants along with small, independent retailers can improve customer experience, and in return, long-term profitability with efficient store layouts. In Store Design and Visual Merchandising: Creating Store Space That Encourages Buying, author Claus Ebster offers valuable insight into maximizing your retail space. The first step to maximize your profitable retail space might be the most unavoidable, however the principle and knowledge behind the customer behavior is crucial for understanding your overall design strategy. Ebster’s research indicates that customers prefer to navigate the floor of a retail store they initially entered. Walking up and down stairs or using elevators and escalators to navigate a store hurts customer flow. When possible, planning for a single floor store design will optimize the customer experience. Exceptions exist, such as downtown locations where real estate is at a premium or large department stores with multiple categories of merchandise. Further, Ebster points out that retailers should consider customer perception if they are a luxury retailer, as shoppers often associate multi-level stores as “elite.” Conversely, if a discount retailer is planning store layouts, as customers associate single floor layouts with “less high-end” merchandise. Consider your overall retail strategy and store layout design prior to selecting your store location. If you have multiple floors, account for the preferences of first floor shoppers by using this space for the feature or high-margin merchandise in your retail mix. Ebster presents some general rules for customer traffic. 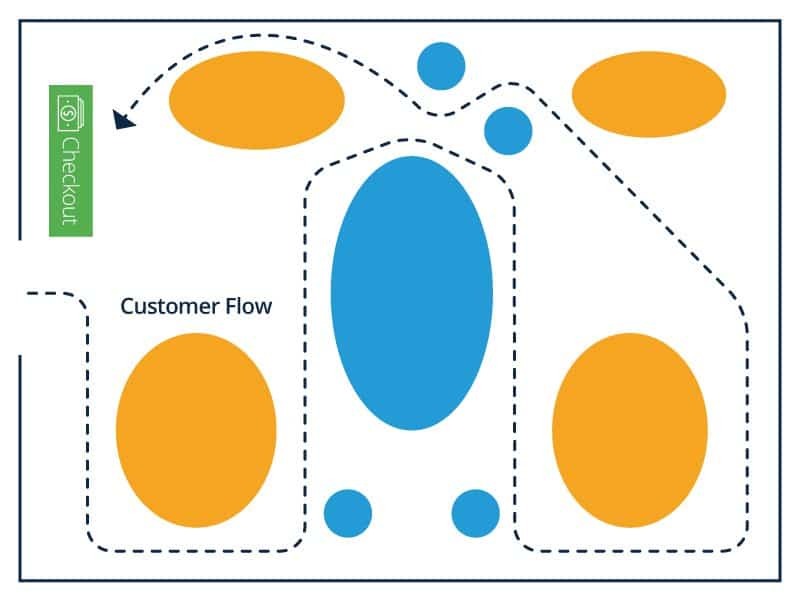 Customer flow patterns vary depending on the type of retailer, the size of the store, and the target customer. Ebster encourages retailers to use their observations to discover the problems and opportunities unique to their environment. 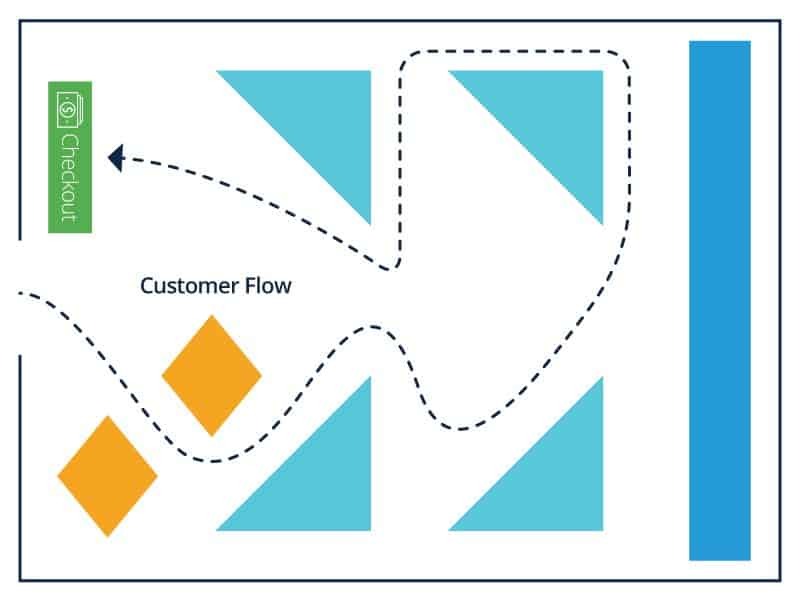 The next step in maximizing your space for profitability is identifying your customer flow. The most effective method for understanding your existing customer flow and identifying areas of opportunity is video recording and heat mapping analysis. This service is available via solution providers such as Prism (you can also do a quick online search for heat mapping consultant services in your area). However, setting aside different times of the day to make in-store observations in person and recording your notes is a step in the right direction for identifying customer flow patterns. After you identify how your customers navigate your entire retail space, turn your attention back to the entrance. The transition zone area, coined the “decompression zone” by Underhill, refers to the space just beyond the entrance to a retail store. The average customer needs this space to transition so they can familiarize with the new environment. Underhill is adamant that nothing of value to the retailer, not high-margin merchandise, prominent signage, or brand information goes inside this zone. Customers need time, however brief, to adjust to new lighting, smells, the music, and the visual stimulation in the store. The next step moves beyond the transition zone and shifts the focus on how to leverage a customer’s tendency to navigate the retail environment. The area just outside of the transition zone is where most retailers make a first impression. Customers consistently turn right after entering the store and continue to navigate the store in a counterclockwise direction. Ebster points out that this customer behavior repeats itself time and again in consumer research. Although researchers and design professionals have different explanations for the reaction, in general, many recommend displaying high-margin merchandise and valuable information just to the right of the entrance (outside of the transition zone). Underhill popularized the “invariant right” and proved the effectiveness of the technique with thousands of hours of video. Once you research and understand how customers navigate your store, you can start influencing how they interact with the merchandise. The foundation for this strategy is the design of your store floor plan. To create an environment that strategically emphasizes the desired purchasing behavior, it is essential to use all of the floor space you have allotted for merchandise, base your layout on the principles of customer behavior, and not sacrifice customer flow for artistic taste. 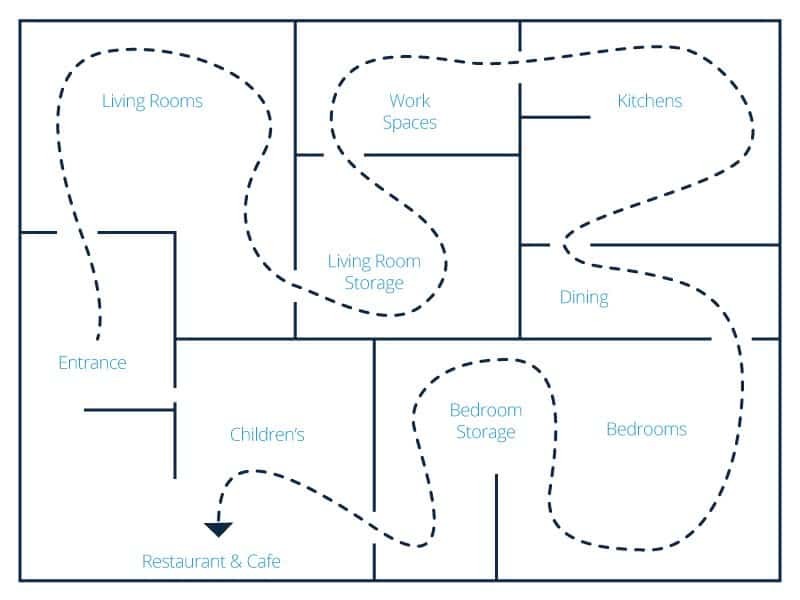 With these factors in mind, the following are common store layouts for your consideration. This layout directs the customer on a predetermined route through the retail store. As an example, Ebster uses furniture retailer IKEA to demonstrate the use of the forced-path store design. Research shows that, with this type of store layout, IKEA achieves a uniform and efficient customer flow that promotes higher sales. Ebster discusses the advantage of a forced-path layout: Every aisle in the store is maximized. With customers exposed to all of the merchandise offered, this design might entice the customer to make an unplanned purchase. However, he points out that using this store layout risks irritating shoppers that have a specific task and desired location, and could also overwhelm shoppers by hurrying them through an experience of customers all moving in one direction together, quickly. Customers can move quickly through an efficient floor space using standard fixtures and displays. The presentation is uniform and comfortable due to its popularity, creating a seamless customer experience. Design simplifies inventory control for the retailer - a key to retail strategy that leverages store design to maximize profitability. However, the downside of this layout is the lack of aesthetics and the “sterile and uninspiring” environment often associated with its use. To counter this, Ebster recommends effective signage to guide customers and create a “cognitive map” of the store. Also known as the “racetrack” layout, think of the loop design as the “yellow brick road” of retail store layouts. 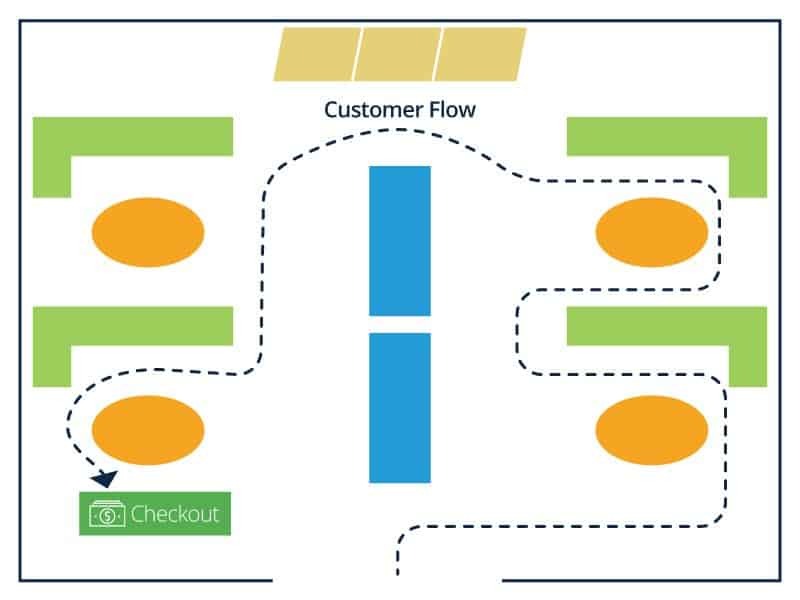 Ebster uses this analogy to describe the way a loop store layout uses a path to lead customers from the entrance of the store to the checkout area. This is a versatile choice for store design when implemented with another layout style or used as a prominent feature of the retail store. Ebster recommends this layout for a larger retail space (over 5,000 square feet) and encourages a clear and visible loop for customer flow. Designers accomplish the loop effect by making the floor path a standout color, lighting the loop to guide the customer, or using a different floor material to mark the loop. Lines are not recommended, as they can be a psychological barrier to some customers, potentially discouraging them from stepping away from the loop and interacting with merchandise. Ebster encourages a loop design that rewards the customer with interesting visual displays and focal points on the way to the checkout area. The straight store layout is efficient, simple to plan, and capable of creating individual spaces for the customer. Plus, a basic straight design helps pull customers towards featured merchandise in the back of the store. Merchandise displays and signage is used to keep customers moving and interested. Liquor stores, convenience stores, and small markets use the straight design efficiently. However, the drawback is the simplicity: Depending on how a customer enters the store and moves past the transition zone, it may be more difficult to highlight merchandise or draw them to a specific location. Just as the name implies, the diagonal store layout uses aisles placed at angles to increase customer sightlines and expose new merchandise as customers navigate through the space. A variation of the grid layout, the design helps guide customers to the checkout area. Small stores can benefit from this space management option, and it is excellent for self-service retailers because it invites more movement and better customer circulation. When the checkout is located in the center and possibly raised up, the diagonal layout offers better security and loss prevention due to the extra sightline effect. The downside of this layout is that it doesn’t enable the customer to shortcut toward specific merchandise, and the risk of narrow aisles is higher. The name of this design is deceptive, as the “angular” store layout relies on curved walls and corners, rounded merchandise displays, and other curved fixtures to manage the customer flow. Luxury stores use this layout effectively because, according to Herb Sorenson’s research from Inside the Mind of the Shopper: The Science of Retailing, customers notice free-standing product displays 100 percent of the time (end cap displays - those at the end of aisles - also get noticed 100 percent of the time). There is a perception of higher quality merchandise that the angular layout leverages to target the appropriate customer behavior in that environment. And although this design sacrifices efficient space use, because of the rounded displays and limited shelf space, if a retailer has sufficient inventory storage away from the sales floor, this layout is useful in creating a unique perception. Popular with retailers targeting trendy millennials and Generation Z demographics, a geometric layout offers artistic expression and function when combined with the appropriate displays and fixtures. The unique architecture of some retail stores, including wall angles, support columns, and different ceiling styles mix well with the uniqueness of a geometric layout. Merchandise displays and fixtures of various geometric shapes and sizes combine to make a statement, often as an extension of the retailer's overall brand identity. Clothing and apparel stores use a variety of environmental merchandising strategies (for example, music, scents, and artwork) with the geometric layout to enhance the customer experience. The mixed store layout uses design elements from multiple layouts to create a flexible option for retailers. Department stores use a compelling mix of straight, diagonal, and angular concepts, among other design elements, to create a dynamic flow through a range of departments featuring a variety of merchandise. Large grocery store chains also successfully combine mixed store layout elements. For example, customers have the flexibility to navigate through a grid layout for their basic groceries but feel compelled to search the angular displays featuring high-margin wine, beer, and imported cheeses. The advantages of combining different store layouts seems apparent, but the space and resource requirements to maintain this design can pose difficulties to retailers. 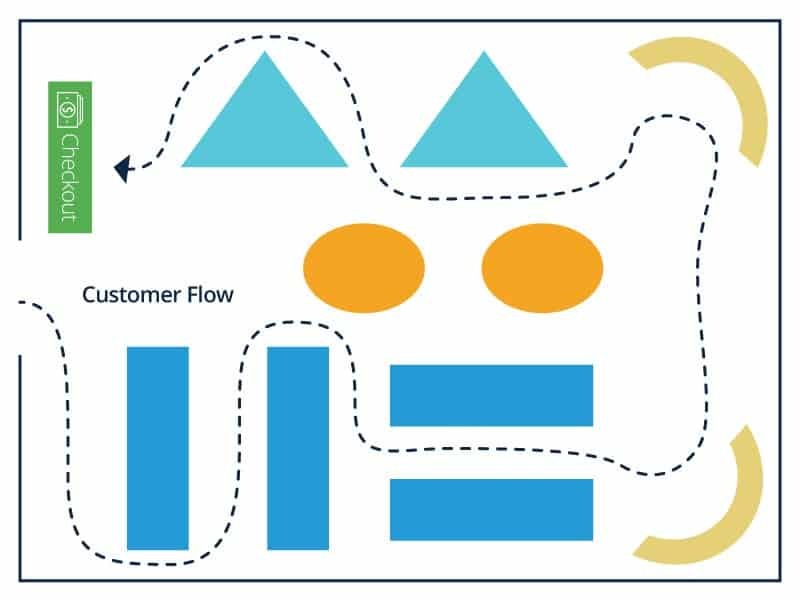 A free flow layout rejects typical design patterns and styles commonly used to influence customer behavior. 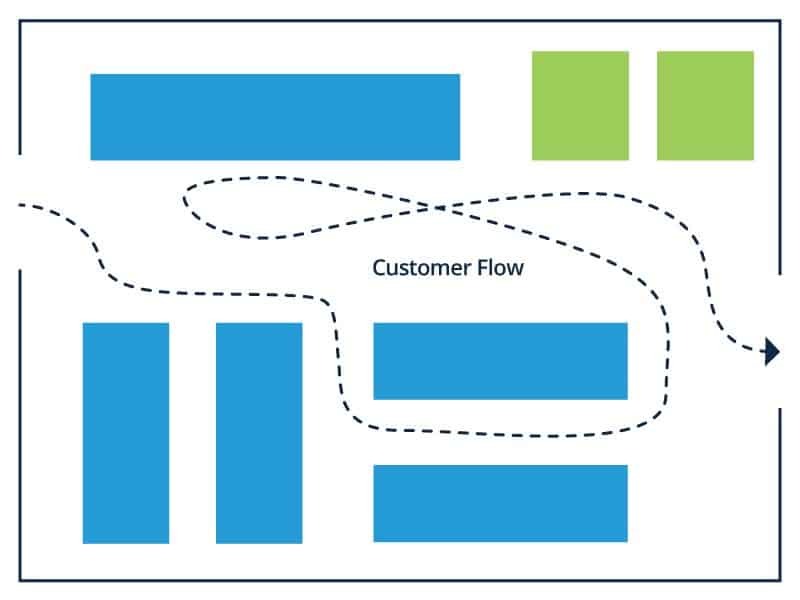 In a free flow layout, the intent is not to lead the customer using predictable design patterns, displays, or signage. There are no specific design rules followed for this retail store design, and customers have more liberty to interact with merchandise and navigate on their own. For this reason, the free flow layout is sophisticated in its simplicity. Ebster points out that customers feel less rushed in this creative environment. Retail stores look less sterile in the free flow design, and merchandise may seem more intriguing. The only limitation for retailers using this layout is the overall space available, but that doesn’t mean that the research on customer navigation behavior and tendencies shouldn’t be accounted for as well. The main disadvantage to this experimental design layout is the risk of confusing customers past the point of their preferred behavior and disrupting customer flow. the most widely used type of free flow layout. Merchandise is separated by category, and customers are encouraged to interact more intimately with like items in semi-separate areas created by walls, merchandise displays, and fixtures. Typically used by boutique clothing retailers, wine merchants, and gourmet markets, this layout stimulates customer curiosity in different brands or themes of merchandise within the overall category. Confusing customers past the point of purchasing behavior. Ultimately, the exploration can distract from customer interaction with the merchandise. 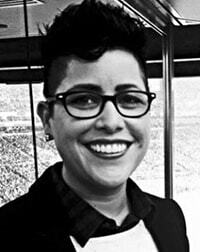 Jaina Rodriguez is a Creative Director of the Integrated Design-Retail Design Studio at Microsoft. She is adamant that store design is important and should not be overlooked when designing the customer experience. Rodriguez does not agree with all of the store layout design and “storytelling” that Best Buy uses throughout some of their locations. For example, she believes the video game section could be designed to be more cohesive and less scattered in different spaces. “So many companies are obsessed with going viral, ROI (which is important), and creating something they think is cool, that they forget why they are doing it. Building fans and purveyors of quality takes time and not every campaign or interactive experience you install will hit the mark,” adds Rodriguez. Rodriguez points to Nordstrom and Tesla as examples of retailers that understand the importance of authentic, real customer experiences that are easy and memorable. To know your customer is to know your retail business. The correlation between a retailer's profitability and the customer experience is closer than ever in retail history. For physical retail stores, this experience is connected to the customer’s surroundings — how they navigate the store’s environment, and the flow of attention they spend on your merchandise and messaging. The digital, online retail experience follows a similar principle. The design of a website or mobile application, and the user experience the layout creates, is critical to creating value for a customer and in return, has a positive impact on the retailer’s profitability. Rodriguez further explains that once data is collected and analyzed and an update is needed, it should happen quickly. If the tests are successful, the formula should be documented and repeated. Using data to design and plan physical or digital retail layouts with the overall experience in mind creates value for customers. “Retailers should not make assumptions about their clientele or only make decisions based on their personal experiences, wants, and needs,” says Rodriguez. She adds a reminder to retailers about the importance of aligning the desired experience of the target customer with retail management and the overall retail strategy. She recommends looking to market research and customer data to make the most impact, remembering that executive leadership, for example, may have a store design strategy that data shows is not aligned with the target customer experience. Connecting the customer experience with a mobile friendly retail strategy is important, as people are increasingly dependent on their mobile devices and interacting with the digital world throughout the day. Retail customers use their mobile devices to stay connected throughout their shopping experience. This might include checking prices and inventory availability, or using their device to find physical store location and hours. “As a mobile-first world, we sometimes must forgo the shiny experiences and provide a user with a friendly, value proposition-focused customer journey with fewer clicks to get consumers where they need to be,” says Rodriguez. Part of a sound mobile-first retail design strategy, when considering your ecommerce site or mobile application, is simplicity. Mobile design strategy means impacting the customer experience by making shopping easier. Rodriguez believes that the more a retailer does to simplify purchasing, the more value they add to the customer experience. She uses Amazon’s strategy for linking new services and products based on the customer’s purchasing habits as an example of the “ease of purchase” experience retailers should strive for. Mobile applications provide an opportunity for retailers looking to make purchasing simple and easy, whether the customer chooses the brick-and-mortar or digital shopper journey. “Stores with robust mobile apps can add on everything from triggering [...] a mobile push alert when [the customer’s] within a certain distance from a store location,” says Rodriguez. This alert might notify customers of an in-store event or send a specific deal on seasonal merchandise based on the geo-location of the customer. “Retailers willing to push the limits of their applications (and spend development dollars) can also use apps to track [in-store] customers and remind [them] of sales or products currently in their cart, request service on the floor with their mobile device, or forgo any interaction with sales reps by ordering everything on their device via scanning barcodes or shopping available stock to have it ready for them at the register,” she adds. Touchscreens: Customers spend an increasing amount of their day interacting with their mobile devices and retailers can leverage this habitual behavior. “Consumers will try to interact with any type of screen out of habit,” says Rodriguez. “This is an opportunity to quickly educate consumers, update content remotely, compare products, and share ratings, reviews, or tech specs.” Rodriguez claims most retailers and businesses using touchscreen presentations or video displays are not taking full advantage of their power. 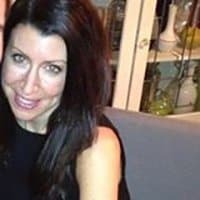 “Most are basically PowerPoint [presentations], or the screens aren’t cared for, or they are turned off, or broken.” She cautions that “customers are too smart and tech savvy” and using this technology in the wrong way can quickly turn a positive effort into a negative customer experience. Heat Maps: A heat map is a visual representation of data. 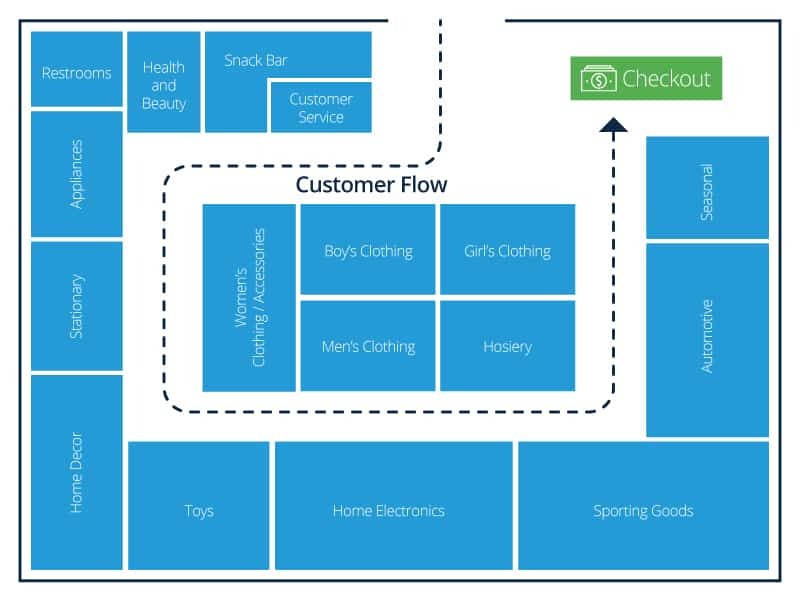 In retail, this data displays how customers interact with merchandise and navigate the retail environment in physical stores using video surveillance to map movement. Heat map technology provides data for online retailers as well, plotting data, and visualizing how a customer navigates and interacts with a website using their mouse for example. Radio Frequency Identification (RFID) Sensors: According to Rodriguez, RFID technology is becoming more popular as retailers experiment with more uses for the sensors including inventory management. “With [RFID] gates installed, supply chain management becomes easier. A retailer can use the tags to sense when a product has moved from the back room to the floor, activate an experience on a screen once a product is picked up or moved, and can take the place of the old barcode system,” she says. Moving merchandise from the end of the supply chain to the customer is a retailer's primary function. Successful retailers do so by creating value and delivering a differentiated customer experience. How customers experience your merchandise is determined by how your store is designed to guide them to interact with it. A retail management strategy that successfully leverages store design to drive customer flow and create unique experiences is a big part of your overall retail brand. It is a proven method for producing the kind of value that keeps retailers competitive and profitable. Allison Walzer, Sr. Retail Channel Marketing Manager at Microsoft, believes store design is a direct reflection of your brand and a vital part of staying competitive with e-commerce trends. Visual merchandising is a core retail strategy. It is the “language of the store,” writes Ebster — the way retailers communicate with the customer through visual imagery and the presentation of merchandise. Part art and part science, visual merchandising involves everything that helps create a unique customer experience. The well-lit entryway, the strategically placed furniture, fixtures, and promotional displays combine with the store layout to influence customer behavior and make the customer’s journey efficient, unique, and memorable. “[We] are noticing a turn to lifestyle- and experience-driven retail experiences,” says Walzer. “Stores are integrating materials from home or outdoors to create a comfortable, beautiful shopping space that leads to longer dwell time in stores.” She describes a visual merchandising strategy that luxury brand retailers use to promote health and beauty by placing living plants inside their stores. Customers also respond to where products are placed. A zone merchandising strategy combines visual merchandising with your store layout design to highlight high-margin merchandise or merchandise you want featured. Creating zones using walls, merchandise displays, and signage develops semi-separate areas. Merchandise displays are set up as speed bumps to keep the customer in the zone and slow them from leaving the area. Proper lighting is more than just making sure the customer can see and interact with the merchandise. When done well, light can help structure and influence the customer’s mood while shopping. Store planners and designers use lighting solutions to highlight or downplay specific areas of the store to draw in customers and create an environment that works in sync with the retail brand and the merchandise offered. Lighting specialists provide expertise in the appropriate types of lighting for specific store layouts, based on natural light exposure, and can recommend solutions that suit budgets and environmentally conscious business models. Signs serve multiple purposes for retailers. They are the graphic representation of the retailer's brand and merchandise. Signs provide product information for specific merchandise, help customers navigate the store layout efficiently, and create the desired price perception. Retailers should keep signs fresh and updated based on the merchandise offered, the season, or specific promotions. Keep in-store signs and messaging consistent with the brand voice and use standard fonts and colors that are easy to identify and read with your lighting. “From a strictly visual perspective, it’s key to have clear readable signage from the outside that leads customers in the store. From there, plan the customer journey from [a] high level,” says Walzer. She recommends using signage that encourages overall shopping (for example, placing old and iconic imagery - specifically for tech stores - towards the front of the store). When the customer arrives at specific merchandise, or the “buy level,” use signage that builds the buy messaging. The word “display” comes from the French word “deployer”, which means “to unfold.” Far from being exclusive to clothing, however, promotional displays help “unfold” the merchandise you offer to the customer. Along with your store layout design, displays set the stage for your customer’s overall experience when navigating the store. In general, displays come in all shapes and sizes, and refer to the movable units in the store that feature merchandise such as tables, racks, or gondolas. Careful selection of the type and placement of displays is crucial to the overall retail strategy of using space management and store design to influence customer flow and in-store behavior. Also, treat displays as flexible, cost-effective investments and ask your product manufacturers and suppliers about providing low-cost options specific to their products and brands. If displays are the flexible, freestanding, and modular units used to present merchandise, then fixtures refer to the more permanent units in the store. Counters, wall mounted shelving units, support columns, and bench seating are examples of fixtures. The purpose of fixtures is to coordinate your store layout and influence customer flow and interactions. In other words, they are designed to impact the customer flow and bring attention to merchandise in a consistent, familiar environment. In general, fixtures are less versatile than displays and in-store design layouts, but when planned carefully, they become a defining part of a retail space. Walzer recommends minimal, clean, and uncluttered fixtures, and modular signage areas to promote offers. Fixtures need to drive a premium look and feel. Materials that are “authentic and have some warmth to them” work best (real wood versus laminate, stone or marble versus coated plastic, glass versus acrylic). Windows welcome customers from the outside and draw them into the store where layout design and the various elements of visual merchandising go to work. The window display requires careful attention to lighting, size of display units, type of merchandise featured, props (like mannequins), and signage. Because the customer has yet to enter the store, a window display must combine all of the visual merchandising elements to successfully pique the customer’s interest and promote the retailer’s brand and personality. As discussed, the visual presentation of merchandise and the influence of store layout design is vital to retail strategy. There are also functional considerations involved in the overall store layout that impacts the customer experience. One example is to keep design functional with the overall space. Legal Requirements: Review the standards issued under the Americans with Disabilities Act (ADA) to understand the legal requirements for retailers in the United States. For example, the ADA requires a minimum of three feet of aisle width for customer accessibility. Consult with qualified professionals if you’re planning changes to your store layout design that may impact customer accessibility. Seating: Provide customers with comfortable seating to enhance the overall customer experience and slow customers down. Clothing stores with dressing rooms are the primary example of this strategy in use. According to Ebster, an extended store visit increases the likelihood that customers make a purchase. Checkout: The checkout area of a retail store is critical to more than cash handling and payment processing. This space accommodates all customers and a variety of interactions, and is typically the last area to make an impression on customers. Depending on the store layout, the checkout area provides additional visual merchandising opportunities. Retailers use this space to encourage impulse purchases of complementary merchandise while customers wait to pay. 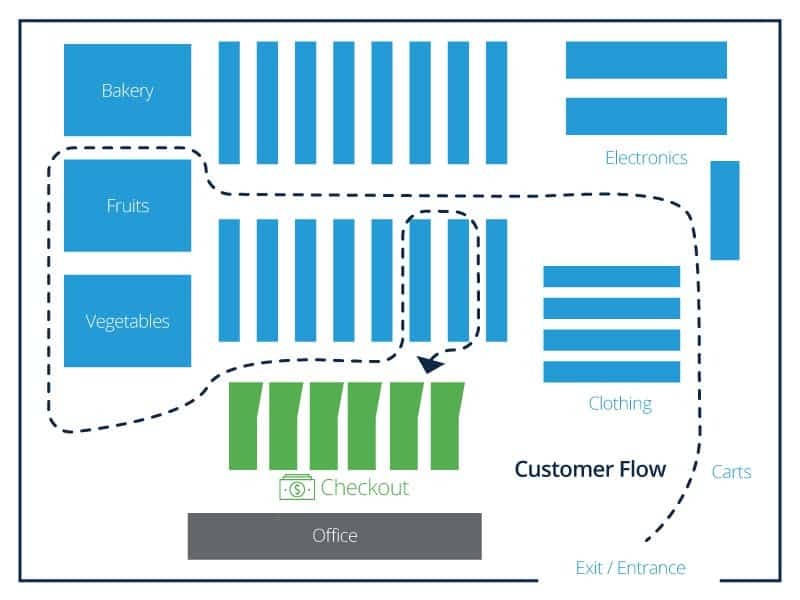 Back-of-the-House Operations: The retail store layout should factor for store operations and activity like shipping and receiving, inventory storage and retrieval, and the employee’s overall workspace and break area. Storage options are essential to the overall store layout design because it impacts how much merchandise you will feature on the sales floor where customers navigate. Ebster recommends keeping the customer in a flow state and focused on shopping. Therefore, maintaining back-of-the-house operations concealed from customers is a visual merchandising strategy. Retail Design Blog: Architects, designers, visual merchandisers, retailers, brand managers, and fans submit pictures and projects about retail design. It includes store and exhibit design, fashion merchandising, visual merchandising content, and more. Store Design and Visual Merchandising: The website design:retail covers retail trends, products, and projects, and publishes an aggregate list of products and services. Retail Design Institute: The Retail Design Institute is the largest and oldest not-for-profit store planning and design organization. Founded in 1961, members include architects, graphic designers, lighting designers, interior designers, store planners, visual merchandisers, resource designers, brand strategists, educators, trade partners, trade media, and students of design. The website publishes a list of design resources. American Society of Interior Designers (ASID): ASID is a multi-disciplinary professional organization for interior designers, students, and retail manufacturers and suppliers that satisfy the organization's acceptance standards for accreditation. Members receive access to services by industry experts in legal assistance, human resources, liability and disability insurance, and more. NCIDQ Certified Interior Designer: NCIDQ Certification tests for industry design standards, and for public health, safety, and welfare. More than 30,000 people are NCIDQ certified, an international standard for interior design professionals by The Council for Interior Design Qualification (CIDQ). Pinterest: Explore store design concepts and ideas through photography and project images posted by a variety of sources. One application you can use to create diagrams of store layouts is Google Drawing, a free software application available in the Chrome Web Store. For store planners, retail consultants, design professionals, or the aspiring DIY retailer, there is a market for drawing and floor planning software to help you create professional retail store layouts. The following list of solutions offers diagramming tools that let you customize existing store layout templates and explore different design ideas. Drawing software provides libraries of design elements for architecture, furniture, fixtures, and floor plan specific symbols. Like most SaaS (software-as-a-service) solutions today, some of the solutions listed below offer customer support and tutorials, cloud hosting features, and software integration with your existing store management software and standard operating systems. Regularly updating your retail store layout and merchandising plan is essential to your ability to continue to attract and retain customers. Once you’ve identified the changes you would like to make, you need a collaborative work management solution to help successfully implement the new layout. On such tool is Smartsheet, a work management and automation platform that enables enterprises and teams to get from idea to impact - fast. 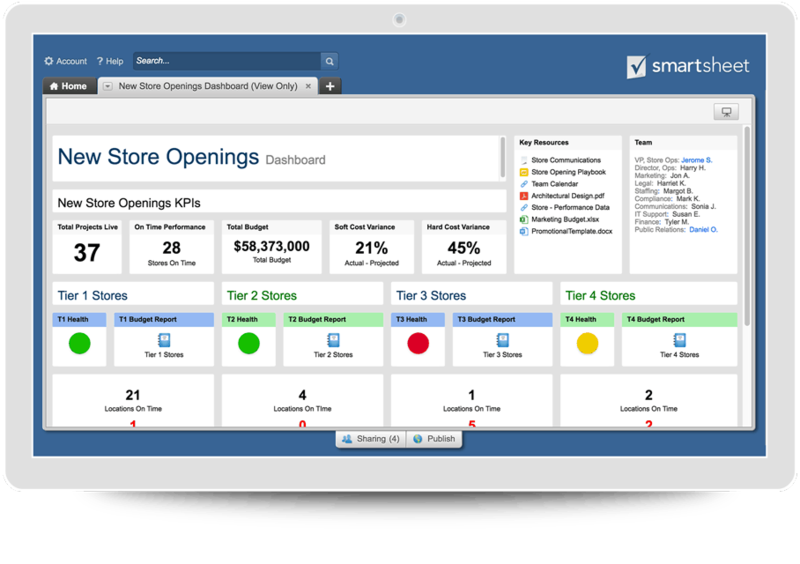 Top retail leaders rely on Smartsheet for store openings and renovations, omnichannel campaigns, store communications, audit and compliance, and more. Use Smartsheet to enhance in-store customer experience, ensure store workers are informed and compliant, and improve efficiency with an auditable system of record. Boost effectiveness and streamline cross-channel collaboration, increase stakeholder confidence, and get teams out of email and spreadsheets with an intuitive platform adopted by all. Discover how Smartsheet can help maximize your retail efforts today.